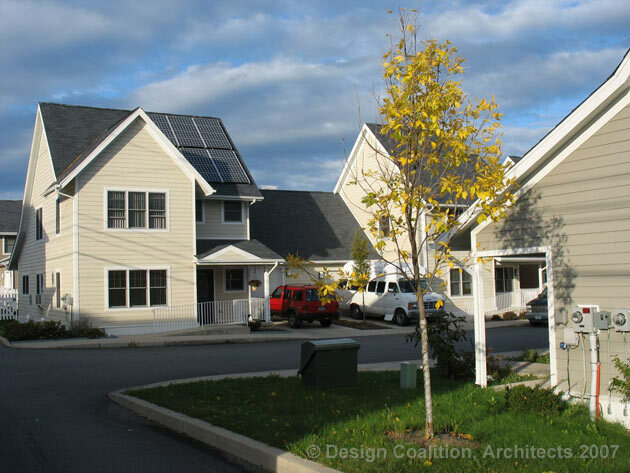 Pine Street Neighborhood Housing is affordable living in an urban setting that emphasizes sustainable design principles, which integrate health and accessibility with energy- and resource-efficiency. Design Coalition designed this community revitalization effort for the Housing Development Corporation of Northeast Pennsylvania (HDC). Decrepit industrial buildings on three city blocks were demolished, and in the process HDC recycled hundreds of tons of steel and heavy timber, and crushed the masonry for use as fill. The 24 new zero-lot line homes feature a 'sun-tempered' design, with living spaces correctly oriented, and with windows and overhangs for good summer shading and natural cross-ventilation. Many homes include active solar systems, either photovoltaic (solar electric) or hydronic (to heat the domestic hot water). With high-performance design and mechanicals, the homes will cost roughly half as much to heat and cool as surrounding homes. 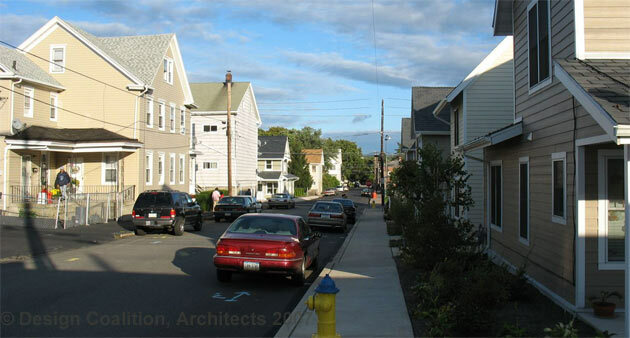 The design of the new homes (above at right) is sympathetic to the surrounding 'twin-homes' (seen at left) that are characteristic of this section of Hazelton. Low-toxin materials inside help ensure healthy indoor air quality. All but a few of the homes are wheelchair accessible, from the city sidewalk throughout the first floor and garage.